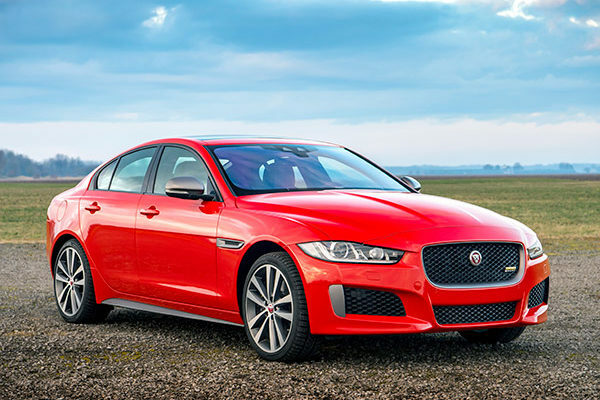 The Jaguar XE is a compact sports sedan challenging the BMW 3 Series. It was all new for 2017, and for 2018 brings a new engine into the lineup, a 2.0-liter turbocharged four-cylinder making a strong 296 horsepower and 295 pound-feet of torque. Jaguar’s chief engineer, Nick Rogers, says the new engine is cleaner and more efficient, using “state-of-the-art exhaust technology and pioneering valve train design.” Called the 30t, it uses twin-scroll turbos with ceramic ball bearings to reduce friction, and a high-flow compressor wheel for performance. Paired with a ZF eight-speed automatic transmission, it can zoom from zero to sixty in a brief 5.2 seconds, and is rated at 28 combined miles per gallon. The hottest engine in the XE line, a supercharged V6 in the S model, gets a boost in horsepower to 380. Other improvements to the 2018 XE include an available Gesture Controlled Trunk Lid, and the latest driver assistance systems, such as the optional Forward Vehicle Guidance and Forward Traffic Detection3. The XE’s rigid aluminum chassis comes from the superb Jaguar F-Type sports car, while other architecture is taken from the new Jaguar F-Pace crossover. The aluminum body contributes to light weight and agility. Its excellent handling brings a sports-car-like connection with the driver. This Jaguar is quick on its feet, as either rear-wheel drive or all-wheel drive. The new turbo four is called the 30t, and joins the existing engines: the 20d, a 2.0-liter turbodiesel making 180 horsepower with 318 pound-feet of torque; the 25t, a more modest 2.0-liter turbocharged four making 247 horsepower; and the S, a fast supercharged 3.0-liter V6 making 380 horsepower with 332 pound-feet. The other engines use an 8-speed automatic as well. The styling is clean and conservative, with sporty proportions. The lack of body frills helps aerodynamic efficiency that helps bring a quiet cabin. The new turbo-four engine is EPA-rated at 25 mpg city, 34 highway, and 28 combined. The diesel, all about torque and fuel mileage, raises it to 30/40/34 mpg. The supercharged V6 brings 20/29/23 mpg to go with its silky speed. Because the XE competes against luxury sedans, there are many available infotainment and safety features: blind-spot monitors, parking assist, head-up display, adaptive cruise, and forward collision warnings with automatic emergency braking. The 2018 Jaguar XE comes in no less than 34 models on the Jaguar price sheet. Base, Premium, Prestige, R-Sport, Portfolio and the new S model, with a mix of the engines. The Jaguar XE 25t ($38,225) comes standard with all-wheel drive and the 2.0-liter turbo four engine. The XE 30t with the more powerful engine starts with Premium trim ($44,625). The rear-wheel-drive S model sports 380 horsepower ($52,275). The XE 30t Portfolio Limited ($60,000) is the most luxurious version. The sheetmetal is tight. The proportions are sporty, with a short nose, wide stance, and fenders full of wheel and tire. Jaguar’s new signature grille distinguishes the front end, and the wide horizontal LED taillights emphasize the car’s width and muscular haunches. The time of Jaguars being known for having cabins of walnut, maple, and rich-smelling leather is past. The cabin of the XE tries to keep up with its elegant ancestors by having infotainment and driver assistance. There is irony there. We’re not sure the ancestors would be impressed. The cabin is well-constructed and under-styled. The dashboard has one broad line, a simplicity that stands against some rivals’ busy ups and downs. Available gauges offer an electronic interpretation of the classic analog tachometer and speedometer, with a modern info display between them. The grippy leather-wrapped three-spoke steering wheel holds a number of controls. The touchscreen at the center of the instrument panel opens infotainment and connectivity. In any car, being precise with the touching can be tricky when the car is in motion, and the XE is no different. The climate controls, located just below the screen, are easy to operate, as are the switches for the heated seats. But the door and window buttons are upside down and anti-intuitive; the window control is high, and door lock low, should be the other way around. The responsive standard touchscreen is 8.0 inches (measured diagonally), with Bluetooth audio and USB port. The InControl Pro is 10.2 inches, with a 12.3-inch virtual gauge cluster, as well as full-screen navigation, SD card slot, WiFi hotspot, and remote vehicle control features via a mobile app. We suffered interrupted Bluetooth streaming, stiff radio toggles on the steering wheel, thin sound from the Meridian audio system, and no Apple CarPlay or Android Auto. The perforated leather is so nice it makes us not miss the rich leather of yesteryear. The navigation system with InControl Pro is slow and a bit labyrinthine, as if the system is in control, not you. The circular gear selector, pioneered by Jaguar, has a chrome top that gets painfully hot in direct sunlight. The front seats are worthy of a sports sedan, bolstered and padded well while being long-haul comfortable. The base trim is a nice synthetic leather, with heating and cooling optional. In the rear, entry and exit is unsmooth because of awkwardly shaped door sills, and comical because of small footroom in the door opening that’s narrow on bottom. Headroom is tight and legroom lacking, and the center rear seat is only fit for small children or adults you don’t like, same as rivals. The trunk is a reasonable 15.9 cubic feet, shaped well for utility. We got some of our seat time at the XE launch in Aspen, Colorado, elevation 8000-10,000 feet, where thin air robs power. But the 20d turbodiesel never hesitated; it was smooth, quiet and well-matched with the 8-speed transmission. We didn’t get to drive an XE with the new 2.0-liter turbocharged engine, but it too will likely handle the mountains, because that’s what turbos do. The XE feels graceful and fluid, with handling that rivals the best among luxury compact sports sedans, including the Cadillac ATS-V and some BMWs. The XE’s electric power steering is perfectly weighted, and the ride is perfectly damped. The chassis feels planted and consistent at speed, with abundant adhesion and hardly a hint of body roll. The standard suspension isn’t harsh, with tires that smooth the edges of the road. The connection between car and river is powerful and gratifying. If that’s not enough, the XE S model uses adaptive dampers that make this baby dance. The S model’s supercharged 3.0-liter V6 also gulped the thin air, turning it into blown power from the supercharger. It can sprint from zero to sixty in about 4.5 seconds, quick for the class. It would be even quicker if automatic transmission could keep up, but it’s not as quick as it should be to handle 380 horsepower. Kickdowns come a bit slowly, on their own in Auto mode. Downshifts as well as upshifts happen more quickly in Manual mode, using the steering-wheel paddles. If the goal of the XE was to present a British challenger to the Germans and Americans, namely the BMW 3 Series and Cadillac ATS, the mission is accomplished. The XE has enough visceral feel to be worthy of Jaguar legacy. The body and cabin present style without flash. Its rigid aluminum chassis emphatically delivers agility, while improving the ride and acceleration. The quick new 296-horsepower four-cylinder turbo engine gets 28 miles per gallon. If you need a more elegant engine, there’s the S model with its supercharged V6 and 380 horsepower.